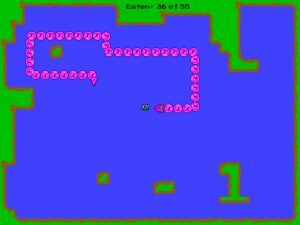 An unfinished snake-like game. In Lake Snake game online you must collect the frogs to progress to the next level whilst avoiding the walls and your own body. Like any other snake game online, the more you eat the longer you grow. In this version there are a few more obstacles to avoid along the way. I didn’t get chance to record the sounds so a quick google for nomnomnom gave me these Sounds to use. I’ll replace them at some point. Choose not to play this if you’re smart or grumpy, I’ve uploaded this in its unfinished state more so that I embarrass myself into finishing it rather than it just sitting on my HDD forever. This may not be the best snake game online but it taught me a few new things I need for future games. -Collision mask on tail so it dies when it should. -The ability to skip levels by entering the code obtained when completing a level. -Internal level builder to make future levels quicker to input. -First release and upload to website. Level jump code added. From the front page or in-game, type 1277 to jump to level 2 or 1369 to jump to level 3.